Now you can use FreeCharge Balance on any website as credit card. 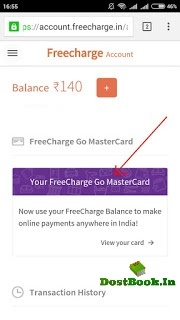 3.Open Menu-> Account Now you will a option of Your FreeCharge Go MasterCard. I personally test it by using this card on snapdeal 🙂 . It works and good news is that you can use cashback balance also as credit card.